Matt Kenseth claimed his first career Kentucky Speedway victory Sunday, taking the lead with a daring, fuel-only pit stop with just 23 laps remaining then driving away to a 0.699 of a second victory in the Quaker State 400 presented by Advance Auto Parts. The win was his series-best fourth of the 2013 season. After ending a 15-year tenure with Roush Fenway Racing at the end of last season to move to Joe Gibbs Racing, Kenseth admitted being a bit surprised to be leading the Sprint Cup Series in victories. "I dreamed about it, but I didn't imagine it would be realistic,” he said. “It's been incredible. We've had some moments that have tested us already this season, but it's great to have the four wins. Hopefully we'll be able to keep it rolling. Kenseth started 16th Sunday, the worst starting position for any winner in Kentucky Speedway’s brief Sprint Cup Series history. He climbed to second by Lap 60, led for the first time on lap 95 and regained the lead for the final time with a gutsy late pit stop that allowed him to lead the final 23 circuits, and 38 in all. Clint Bowyer was third, followed by Joey Logano and Kenseth's JGR teammate, Kyle Busch, who rebounded from an early spin to finish fifth. Kurt Busch, Sonoma winner Martin Truex, Jr., Jeff Gordon, Jimmie Johnson and Kevin Harvick completed the Top-10. Johnson appeared to have the dominant car for much of the day, leading a track record 182 laps. But the championship leader Jimmie Johnson spun while running second on a restart with 20 laps to go, before mounting a furious comeback that brought him back inside the Top-10 at the checkered flag. Godfather Motorsports will field a second Super Late Model in a 10-race schedule of events this season for teenager Tyler Dippel of Wallkill, NY, and veteran Glenn Sullivan of Westbury, NY. Dippel began his racing career on motorcycles, but switched to four-wheeled competition after an unplanned trip over the handlebars left him with a broken collarbone. At age eight, he transitioned to Slingshot race cars – scaled-down versions of a Dirt Modified racer powered by a 50-horsepower engine running on methanol fuel – and began winning races almost immediately. In only his third year of competition, he claimed the 2010 National Slingshot Junior Championship, winning five times in eight starts on tracks from upstate New York to southern Pennsylvania. Late in the season, Dippel competed in the Senior Slingshot Class against experienced adult drivers, winning two of his three starts over fields of 20 to 25 cars. 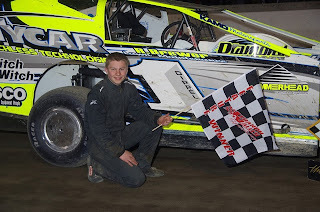 In 2011, Dippel began competing in the Sportsman Class, driving 500 HP cars at speeds of up to 120 mph on dirt tracks around the northeast. He once again proved to be a quick study, winning in only his fifth career Sportsman start, finishing second in Empire Region championship points and earning Rookie of the Year honors while competing on a wide variety of tracks from New Hampshire to southern Pennsylvania. 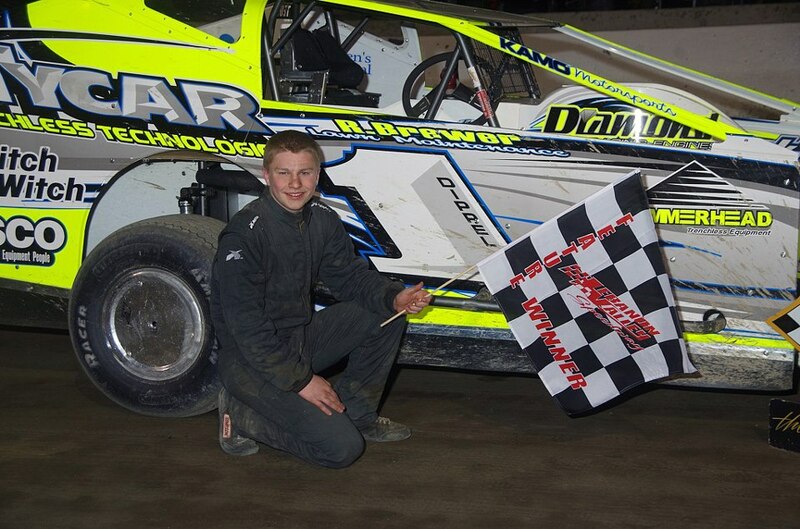 Since then, he has remained a top competitor in the Small Block Modified ranks, competing at the Middletown, Accord and Lebanon Valley Speedways in his native New York. His resume currently includes more than 20 main event wins, all while maintaining a 4.0 GPA and attaining National Honor Society status. “I keep ahead of my school work and do extra when I have time,” said Dippel. “Sometimes, I take work to the track and do it between races and practices.” Dippel also donates 50-percent of his on-track winnings (thousands of dollars in 2012 alone) to the St. Jude Children’s Research Hospital, an institution recognized for its treatment of children with cancer and other catastrophic diseases. Sharing time with Dippel this season will be Glenn Sullivan of Westbury, NY, a former modified track champion at New Egypt (NJ) and Evergreen (PA) Speedways. He earned modified Rookie of the Year honors at Connecticut’s Thompson Speedway in 1989, along with “Most Improved Driver” designation at the Waterford (CT) Speedbowl before embarking on a lengthy and successful career on NASCAR’s Busch North (now K&N Pro Series East) Tour. A major sponsor for the No. 1 Godfather Motorsports Ford will be made in the coming days. Associate sponsorship for Wednesday night’s “Firecracker 150” will be provided by TYCAR Trenchless Technologies of Wallkill, NY. Additional associate sponsorships are available, for information, contact Dave Moody at mrnturn1@hotmail.com. About Godfather Motorsports – Godfather Motorsports is owned by Motor Racing Network and Sirius XM NASCAR Radio personality Dave Moody and enjoys major sponsorship from Bebida Beverage Company’s KOMA Unwind "Liquid Relaxation" drink. The team also boasts a comprehensive list of technological and marketing partners that includes Valvoline Motor Oil, Eibach Springs, ASM Graphics, Race 101, CV Products, ARBodies, TYCAR Trenchless Technologies and Phantom Racing Gear. For additional information on the team and marketing opportunities with Godfather Motorsports, contact Dave Moody -- mrnturn1@hotmail.com. Visit the Godfather Motorsports website at www.GodfatherMotorsports.com. 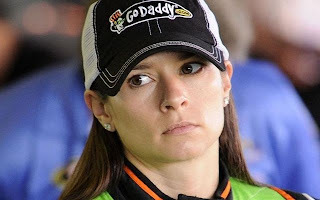 While the Stewart Haas Racing rookie clearly disagreed with Petty’s assessment, she declined to be lured into a war of words. Patrick said she long ago accepted the fact that some people don’t like her, and never will. "I really don't care,” she said. “There are plenty of people who say really bad things about me. People want me to die. You get over that stuff.” She also said she prefers to simply tune-out the negativity and focus on those who are in her corner. Penske Racing driver Brad Keselowski continues to be recognized for his 2012 NASCAR Sprint Cup Series championship. ESPN announced Thursday that Keselowski has been nominated for two awards during this year’s ESPY Awards Presentation that will be held on Wednesday, July 17 at the Nokia Theater in downtown Los Angeles. After a five-win season in the No. 2 Miller Lite machine, culminating the first Sprint Cup championship for Penske Racing, it comes as no surprise that Keselowski received a nomination for Best Driver. In a late-season push over the last 20 weeks of the 2012 season, Keselowski scored 17 Top-10 finishes – including three wins – to secure the title. Over the 20-year history of the ESPY’s Best Driver category, 14 of the 20 winners have come from NASCAR competition. Following a toe-to-toe battle with five-time series champion Jimmie Johnson for the title, Keselowski and the No. 2 Miller Lite team will also be in the running for the Best Championship Performance award. With the two nominations, Keselowski could become the first Penske Racing driver to win an ESPY. The 2013 ESPY Awards will air live on ESPN on Wednesday, July 17 at 9 pm ET. Fans can visithttp://espn.go.com/espys/2013/ to cast their votes. Voting will end at 7 pm ET on July 17. "I don't think she's ever going to be a race car driver." 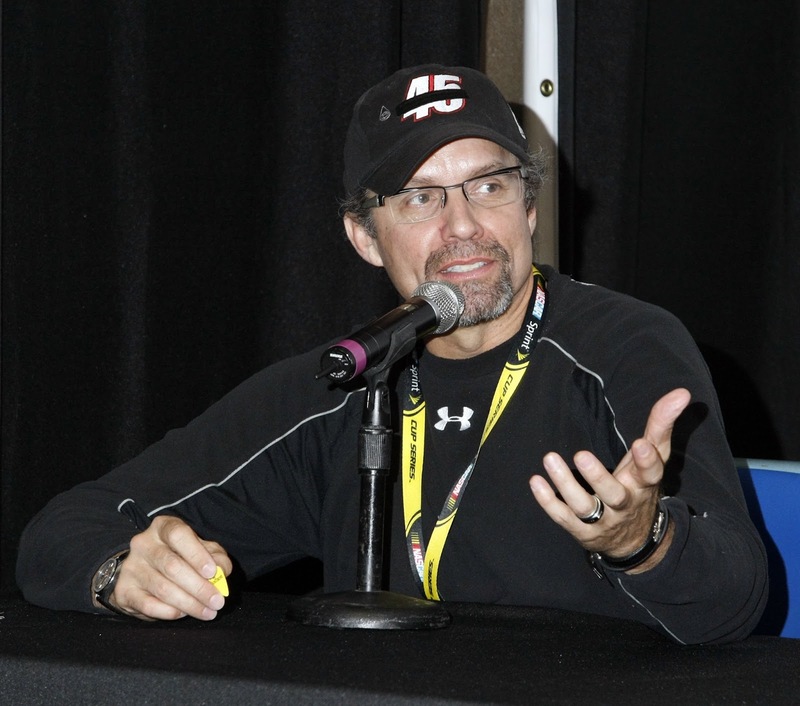 NASCAR drivers weighed in today on Kyle Petty’s assertion that Danica Patrick will never be a race car driver. Speaking on Thursday’s NASCAR Race Hub on SPEED, Petty said of Patrick, "Danica has been the perfect example of somebody who can qualify better than what she runs. She can go fast, but she can't race. I think she's come a long way, but she's still not a race car driver. I don't think she's ever going to be a race car driver, (it’s) too late to learn." Dale Earnhardt, Jr. took issue with Petty’s statements, saying, “I have to disagree with Kyle. I think she is a tough competitor and she works really hard at what she does. She has run some really good races. “On every occasion she is out running several guys out on the circuit,” Earnhardt said. “If she was not able to compete and run minimum speed, or finished in last place every week, I think you might be able to say Kyle has an argument. But she’s out there running competitively and running strong on several accounts. Patrick has struggled in her first full season of Sprint Cup competition, currently ranking 27th in points with a single Top-10 finish. Her only Top-10 of the season came in the 11th of her 26 starts to date. By comparison, Petty claimed a Top-10 finish in his first career start at Talladega in 1979, and managed 21 Top-10 finishes in first 80 starts. His first win did not come until his 149th career Winston Cup Series start, in his sixth season of full-time competition and his eighth overall. Kevin Harvick called Petty’s comments, “a loaded gun,” adding, “This is hard to do. “There is really no good training ground for it anymore in the Nationwide and Truck Series because of the lack of horsepower,” he said. “It is really hard to understand what you need to drive these cars, and to be able to drive them fast. It is not something that is going to happen overnight. Five-time series champion Jimmie Johnson also defended Patrick, saying a Sprint Cup car has little or nothing in common with Indy Cars, where Patrick competed before moving to NASCAR. “When I look at the vehicles, the way you make them handle, the downforce numbers and the mechanical grip… the Cup car has a lot of mechanical grip and very little downforce,” he said. “It’s just the opposite for an IndyCar." He also said the style of competition is dramatically different between the two series. “IndyCar guys and girls don’t (do) a lot of side-by-side racing. It’s like a restrictor plate track, running wide-open. It’s not the competitive passing and racing and fighting for position like you see in NASCAR, and it takes a while to figure it out." Harvick said Patrick is “fortunate to have a sponsor that is willing to back her and take those learning experiences with her. Hopefully as the weeks progress, she’ll get better and better. “I couldn’t imagine coming in here having two-and-a-half years of stock car experience, and expect to be competitive knowing what all this entails. It’s hard, and it’s not going to get easier. There’s nowhere to figure out how to drive them, other than on the race track on Sunday or Saturday. Harvick called criticism like Petty’s “the unfair part of being really popular. In (Danica’s) case, she obviously has a lot of attention and things that come with it. She seems to have become kind of immune to it. I think she is realistic with her goals and understands that she has a lot to learn." He also offered her some unsolicited advice on how to deal with critics, saying, “It is easier just to turn it all off, not read it, not listen to it. 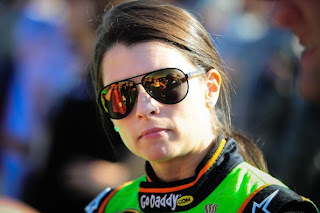 At some point, whether it is her, myself, Dale, Jr. or Tony Stewart; you are going to be criticized and you are not going to like it if you read. 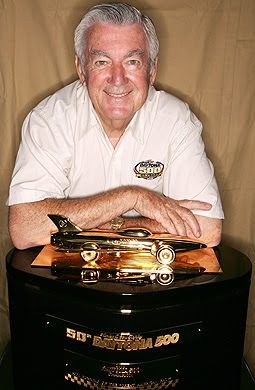 Three-time Daytona 500 champion Bobby Allison will serve as Grand Marshal for the Subway Firecracker 250 Powered By Coca-Cola NASCAR Nationwide Series race on Friday night, July 5 at Daytona International Speedway. Allison will give the starting command to the 43-car field that will do battle in the 100-lap, 250-mile event. Allison, a NASCAR Hall of Famer, is one of the most successful drivers in Daytona history. 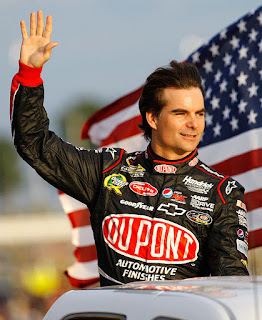 In addition to his three victories in “The Great American Race,” Allison won the July NASCAR Sprint Cup Series summer race another three times. Overall, Allison has 16 career victories at Daytona, which puts him third on the all-time list. The July NASCAR Nationwide Series event at Daytona is bearing a new name in 2013 – the Subway Firecracker 250 Powered By Coca-Cola. The origin of the name “Firecracker” dates back to the first year of operation of Daytona International Speedway in 1959. The inaugural NASCAR summer race was run as the Firecracker 250. The summer NASCAR Sprint Cup Series event at DIS included “Firecracker” in the event from 1959 through 1988. The Subway Firecracker 250 Powered By Coca-Cola is also the first “Dash 4 Cash” race, which is bonus program where the top four drivers to receive NASCAR Nationwide Series driver championship points are eligible for a $100,000 bonus. Sandler, James and O’Neal will give the “Drivers, start your engines” command in the Independence Day holiday classic. They will also be introduced at the driver’s meeting, participate in pre-race ceremonies, and ride in the Grand Marshal cars during the pace laps prior to the green flag of the 160-lap, 400-mile race. This marks the fourth time that Sandler has served as Grand Marshal for a NASCAR event, having previously served at Talladega once and Michigan twice. This will also mark Kevin James’ return to Daytona and his third time as NASCAR Grand Marshal; James also previously paced the Toyota All Star showdown and did a few test laps at Texas Motor Speedway. In “Grown Ups 2,” the all-star comedy cast from “Grown Ups” returns (with some exciting new additions) for more summertime laughs. After moving his family back to his hometown to be with his friends and their kids, Lenny (Adam Sandler) finds out that between old bullies, new bullies, schizo bus drivers, drunk cops on skis, and 400 costumed party crashers, sometimes crazy follows you. “Grown Ups 2” will hit theaters on July 12, 2013. “Grown Ups 2” is directed by Dennis Dugan, produced by Adam Sandler and Jack Giarraputo, and written by Fred Wolf & Adam Sandler & Tim Herlihy. O’Neal retired from NBA in 2011 after having captured four NBA championships during his 19-year professional career. He was also named NBA Finals MVP three times, was a 15-time NBA All-Star and earned an Olympic Gold Medal. While deployed in Iraq, Gunnery Sgt. Samuel Deeds, a diehard NASCAR fan, dreamed of working in the sport after completing his service. 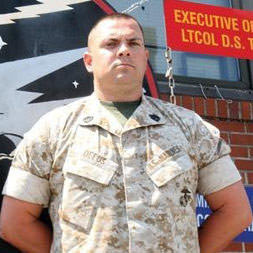 In 2005, those dreams took a back seat when Deeds placed himself in harm's way to save the lives of his fellow Marines. This summer, Deeds will travel to one of the country's most historic tracks, Indianapolis Motor Speedway not as a fan or employee, but as the race’s namesake. On June 27 in his hometown of Erlanger, Ky., Deeds was recognized as the winner of Crown Royal's "Your Hero's Name Here" program, which awards one deserving individual naming rights to the NASCAR Sprint Cup Series race Sunday, July 28 at IMS. Surrounded by friends, family and Marines, Deeds cemented his place in the NASCAR record books by laying the final brick, engraved with the official race logo, in a ceremonial "Yard of Bricks" at Flagship Park in Erlanger. While deployed in Iraq, Deeds came across an improvised explosive device while setting up a vehicle checkpoint. Upon seeing fellow Marines approaching, he exposed himself to the device, risking his life to save others. He was severely injured and underwent more than 30 surgeries and procedures following the blast. Three years later, while still recovering, Deeds' heroic instincts took charge once again when he saved the lives of three individuals caught in a rip tide off the coast of North Carolina. In addition to Deeds' friends and family, special representatives from Crown Royal, Big Machine Label Group and IMS attended the ceremony and spoke of Deeds' many accomplishments. NASCAR driver Kurt Busch surprised Deeds during the ceremony, appearing on behalf of the Armed Forces Foundation , and country music star Justin Moore debuted a special song titled "Heroes," which was penned specifically for the "Your Hero's Name Here" program. Consumers 21 and over can visit CrownHeroesSong.com to download "Heroes" for free. For every download redeemed between now and the Crown Royal Presents the Samuel Deeds 400 at the Brickyard Powered by BigMachineRecords.com July 28, Crown Royal will donate $1 to AFF. "I was so fortunate to be part of this program last summer," Moore said. "That experience and the brave men and women I met along the way served as inspiration for this new song. The opportunity to debut 'Heroes' in front of a true hero like Samuel, his friends, family and community is incredibly special to me as well as all of the folks at BMLG." This will mark the seventh time Crown Royal has awarded race naming rights to an adult fan. After receiving thousands of entries during the nomination period, five heroes were chosen as finalists, and adult fans had the opportunity to cast their votes for the person they felt was most deserving of the honor. As the winner of the program, Deeds will participate in a VIP race weekend experience, riding in the pre-race pace car, delivering the trophy bearing his name to the race winner in Victory Lane and participating in the "kissing the bricks" ceremony following the race. "I've been a NASCAR fan for as long as I can remember, so the reality of having my name on a track with such rich history and meaning is beyond words," Deeds said. "I am so grateful to all of those who took the time to hear my story and vote for me. I can't wait to attend the race and dedicate that special weekend to all fellow servicemen and women who put their lives on the line every day." Deeds, now retired from his service in the Marines, is a husband and father of two boys. His wife, April, nominated him for the program for his unwavering commitment to his country. "We could not be more honored to announce Gunnery Sgt. Samuel Deeds as the 2013 'Your Hero's Name Here' winner," said Abby Wise, brand director for Crown Royal. "His sacrifice and continued acts of heroism serve as an inspiration to all of us at Crown Royal, and we are proud to provide him with the ultimate race experience at the Brickyard next month." The official race title, Crown Royal Presents the Samuel Deeds 400 at the Brickyard Powered by BigMachineRecords.com, will be incorporated into race memorabilia as well as the winner's trophy. Various events and celebrations will take place leading up to and throughout race weekend to honor Deeds, during which Crown Royal would like to remind adult consumers to please drink responsibly. "It is our privilege to participate in this program with Crown Royal for the second year at IMS," said Indianapolis Motor Speedway Corporation Chief Operating Officer Doug Boles. "We've been introduced to so many deserving American heroes, and we look forward to rolling out the red carpet for Samuel and all other heroes in attendance at this year's race." Through a partnership with Crown Royal and IMS, country music artists from Big Machine Label Group including Justin Moore, The Cadillac Three, Cassadee Pope and Dustin Lynch, will perform special concerts throughout the race weekend. 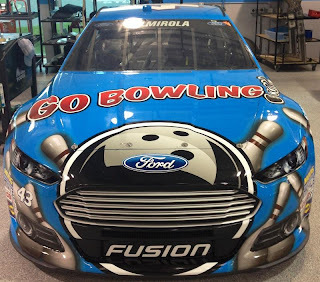 The most recognizable car in NASCAR will now feature the number one participatory sports activity in the country; bowling. Richard Petty Motorsports and Strike Ten Entertainment have announced the launch of a new partnership that features GoBowling.com as a primary sponsor of the No. 43 Ford Fusion driven by Aric Almirola. The official unveiling of the No. 43 GoBowling.com Ford Fusion took place earlier today, with Richard Petty giving attendees of the International Bowling Expo a first look at the car, while also posing for photos and signing autographs. Later this summer, the car will make its on-track debut at the GoBowling.com 400 on August 4 at the Pocono Raceway in Pennsylvania. 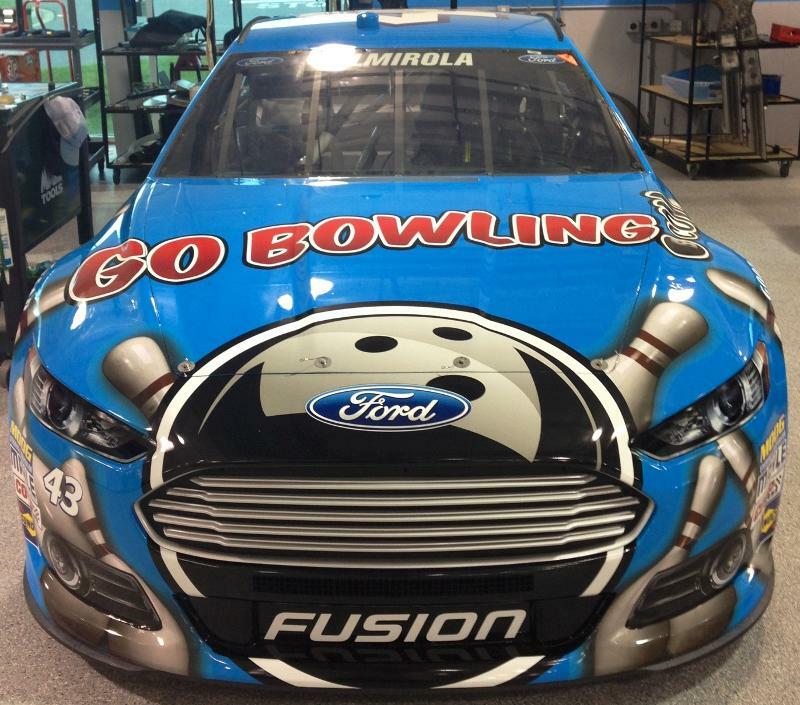 GoBowling.com will also be the primary partner for the No. 43 team at that event in 2014. "There is no better way to add to the excitement of International Bowl Expo than to celebrate the launch of our partnership with Richard Petty Motorsports and the No. 43 race team," said Frank DeSocio, President of Strike Ten Entertainment. "There are very few athletes in the world who have the iconic stature as "The King" Richard Petty. He, like bowling, is known in every corner of the world. Richard and Aric will be great ambassadors for the sport and all our bowling centers across the country." "Just like racing, bowling is pure Americana," said Petty. “It's our nation at its best, a sport that brings people together and creates memories. Not to mention bowling is a lot of fun. I couldn't be more proud to partner with GoBowling.com - and there's no better stage than International Bowl Expo." Almirola agrees that this is a natural partnership. "This is really a great partnership for our race team and an incredible brand association with GoBowling.com,” he said. “You literally can't get any bigger than bowling, it's the nation's number one participatory sport. In racing, we're all about results and more than 71 million people go bowling every year. We don't always have free time between races but when we do, our team is always looking for fun activities and ways to relax. Going bowling is something that is easy, affordable and enjoyable for us all. We're better at racing than bowling, but we all have fun when we go bowling. I'm glad that we can be a part of promoting such a great experience to our race fans." GoBowling.com is the website to visit to learn more about the 2,100+ bowling centers around the country. Fans can learn about their local bowling centers, promotional offers, bowling tips and more. Currently, GoBowling.com is running a national promotion for one lucky race fan to wave the green flag to start their NASCAR Sprint Cup event on August 4. This partnership with RPM is their first with a team and driver. 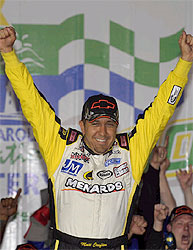 Matt Crafton has 14 career NASCAR Camping World Truck Series starts at Kentucky Speedway, most of any series driver. In Thursday night's UNOH 225 -- the Truck Series' eighth race this season – he will also extend his series record for consecutive starts to 301. Crafton has a series-best nine Top-10 finishes at Kentucky, including a pair in 2012. The fact that Crafton currently holds a 23-point lead in the Truck Series' standings over rookie Jeb Burton makes a pretty positive combination for the Tulare, Calif., native. "Kentucky's definitely one of my favorite racetracks to go to -- it's just an awesome place to race," said Crafton. "It's got a lot of character, it's rough and it makes you move around to find a place your truck likes to run in. "It makes all the drivers and crews work really hard on their stuff, because it's really rough and hard to get ahold of, so finding the right setup to make your truck handle is really a chore. But it's a cool racetrack." Kentucky has attracted a couple of Sprint Cup Series stars to Thursday night’s Truck Series lineup, including defending champion Brad Keselowski and triple-threat standout Kyle Busch, who has a win in his three career Kentucky Truck starts. Crafton said he doesn’t mind the threat of Sprint Cup interlopers. "They are two more guys you're going to have to beat, no question,” he said. “Kyle is good in everything he gets in, everywhere. But you can't forget the competition we're faced with each and every week in the Truck Series; the usual suspects we have to deal with everywhere. "Sometimes we're able to out-run Kyle, sometimes not. We were real close to beating him at Dover, but he was just too strong in the end. We've just to keep working on our stuff and making it better and better each and every week." Crafton has taken consistency to a new level this season, thanks to crew chief Carl "Junior" Joiner, who is in his second full season as crew chief of the No. 88 Toyota. His seven-race string of Top-10 finishes is the third-best of his career, behind a string of 19 consecutive top 10s from 2010-2011 and 10-in-a-row from 2009-2010. "We have absolutely taken our game to another level this season," Crafton said. "The chemistry we've got on this team is incredible. Me and Junior have always been able to work together well, but this is the second year he's been with all the guys and the chemistry and communication they have is something special." As a four-time NASCAR Sprint Cup Series champion, Jeff Gordon has little trouble getting the ear of NASCAR. And after a runner-up finish behind winner Martin Truex, Jr. Sunday at Sonoma Raceway, Gordon had a couple of suggestions for the sanctioning body on possible modifications to its Sprint Cup Series road course rules. "We don't have the body in the right position for the road courses to turn right,” said Gordon. “When we go to Watkins Glen, as fast as those right handers are, we're going to have some issues. There's nothing to lean on. You have plenty of grip on the left (turns), because the body still has a little bit of rake… nice side force on the right side of the car for those left turns. But on the right turns, the cars are just so out of control. “Other than that, I love the Gen-6 car everywhere we go,” he said. “It's got good grip and drives well and looks great. I think other than those fast right handers, it was the same here (at Sonoma) today." ThorSport Racing confirmed today what GodfatherMotorsports.com first reported last Tuesday, that NASCAR K&N Pro Series East championship contender Brett Moffittwill make his NASCAR Camping World Truck Series debut in the No. 13 AISIN Toyota Tundra in Thursday's UNOH 225 at Kentucky Speedway. Moffitt, 20, a native of Grimes, Iowa, is currently second in the K&N Pro Series East title chase and has nine victories in 54 career K&N East starts. In those 54 starts, he has finished in the Top-5 33 times and in the Top-10 40 times. Moffitt has never finished worse than third in points in four full K&N East seasons, and will make his Kentucky Speedway debut on the longest oval track on which he's ever raced. 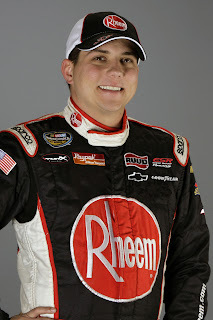 A year ago, he finished ninth in his NASCAR Nationwide Series debut at Iowa Speedway, and he claimed a 10th-place finish in ARCA competition at Rockingham Speedway in 2009, at age 16. "Brett did a really good job last year for us in the NASCAR K&N Pro Series East, finishing third in the championship points," said his K&N Series team owner, Shigeaki Hattori. "I wanted to give Brett the opportunity to race in the Truck Series and showcase his talent." The No. 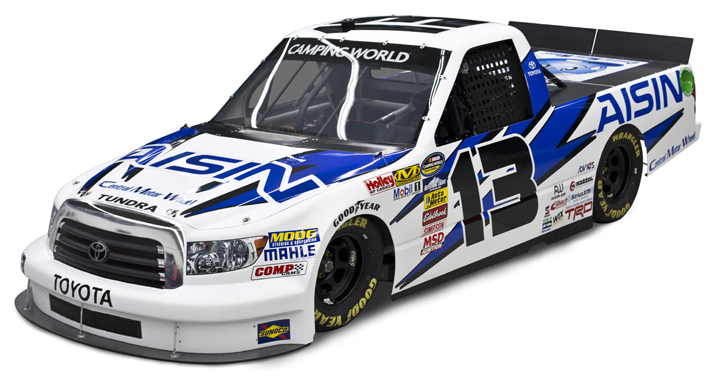 13 Toyota has been driven in the season's first seven races by Todd Bodine, who has the truck 17th in the current NCWTS owners' standings, making Moffitt is a guaranteed starter at Kentucky. "I'm very grateful for this opportunity I've been given with ThorSport and HRE to drive the No. 13 AISIN Toyota Tundra this week at Kentucky Speedway," Moffitt said. "A mile-and-a-half track will be a new experience for me but I can't wait to get behind the wheel and start learning." With 20 races still remaining in the 2013 NASCAR Sprint Cup Series season, time is running out for Denny Hamlin. The Joe Gibbs Racing driver finished 23rd Sunday at Sonoma Raceway, the latest in a series of disappointing results for the Virginia native in recent weeks. It leaves him 25th in the championship standings -- a whopping 83 points from the Top-20 – and facing the prospect of failing to make the Chase for the first time in his career. That’s almost two full races out of the hunt, discounting the fact that he remains winless in 2013, as well. Make no mistake about it, Hamlin is a championship longshot, arguably for the first time in his NASCAR career. After sitting out four races with a compression fracture in his spine, Hamlin’s back was literally against the wall in May. Unfortunately, a team that had no remaining margin for error has made a number of them. There have been mechanical failures, strategic miscues, ill-handling race cars and crashes; all of which have dug Hamlin’s 2013 grave a little bit deeper. Off the injured list and heading to Darlington in early May, Hamlin was 76 points out of the Top-20. Today, with six more races in the rearview mirror, he’s 83 out. Denny, you’re going the wrong way! 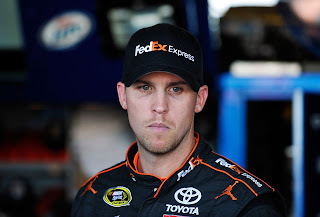 “I love the challenge,” said Hamlin at the time of his return. “The less realistic it is, the bigger the challenge it is for me. It's going to be all on my shoulders to make the run toward the Chase. We have a huge, huge hole to dig out of, but there's nothing wins can't fix." Unfortunately for Hamlin, the wins have not come. An encouraging, runner-up finish in his fulltime return at Darlington was followed by a fourth in the Coca-Cola 600 at Charlotte. Hamlin was unable to build on that momentum, however, struggling to a 34th-place finish at Dover and a 30th at Michigan, prior to Sunday’s latest letdown. To his credit, Hamlin refuses to pin any of the blame on his chronically ailing back. "I feel fine,” he insisted. “There's nothing that I feel in the car that keeps me from performing better. We missed the setup a couple of weeks and had bad stuff happen. It's just frustrating that we can't get a finish." Now, even Hamlin admits that his Chase hopes are dim. "I'd have to have a lot of stuff go my way," he said. "We're not gaining anything on 20th. We need a lot of help, honestly." While many of the tracks that lie ahead have been good to Hamlin in the past, he said past performance is not necessarily a predictor of future success. "We're not running that strong,” he said. “We're not running as strong as the Chase guys right now (and) you can't expect other guys to make mistakes." Even his JGR teammates, Matt Kenseth and Kyle Busch, are outperforming him at present, a fact that is not lost on Hamlin. He’ll have to outrun a lot of people in the next few weeks to have any hope at all. Former NASCAR Camping World Truck Series winner Cale Gale will return to the driver's seat at Kentucky Speedway on June 27th driving the No. 30 Rheem Chevrolet Silverado for Turner Scott Motorsports. Gale captured his first Truck Series win last November in the season finale at Homestead-Miami Speedway. He has 32 previous NCWTS starts with one win, three Top-5 and 10 Top-10 finishes, and will attempt to make his fourth career start at Kentucky Speedway. "I can't thank everyone at Rheem and Turner Scott Motorsports enough for this wonderful opportunity to get back behind the wheel of a truck," said Gale. "Rheem has been a great supporter of mine through much of my career and to be able to carry their colors in my return is an honor. TSM has a great intermediate track program and I don't expect anything different from my team, I hope that we will be able to bring home a solid finish for everyone at Turner Scott Motorsports." You won’t find the names of Janice Scafetta and Suzanne Sundstrom anywhere in the official results from the recent Quicken Loans 400 at Michigan International Speedway. The winner of the “MRN Free Pass Presented by Drive to End Hunger & Quicken Loans!” will receive a “free pass” from mortgage payments for one year, valued at $22,000, and $5,000 in groceries – with a matching donation to the regional food bank of the winner’s choice. The Grand Prize winner will also be awarded an all-expenses-paid trip for two to the 2014 Daytona 500 that includes a meet-and-greet with four-time NASCAR Sprint Cup Series champion Jeff Gordon, driver of the No. 24 Drive to End Hunger Chevrolet SS for Hendrick Motorsports. Monthly winners – like Scafetta, from Vero Beach, Fla., and Sundstrom, from Horse Shoe, N.C. – will be selected to receive $500 in grocery money and are also eligible for the Grand Prize. The “MRN Free Pass Presented by Drive to End Hunger & Quicken Loans!” sweepstakes runs through Nov. 17. Fans can enter by visitingwww.motorracingnetwork.com/freepass. The “MRN Free Pass Presented by Drive to End Hunger & Quicken Loans!” will be regularly promoted during the network’s Sprint Cup Series race broadcasts, through MRN social media channels and on its website at www.motorracingnetwork.com, where additional sweepstakes details are available. The last time Martin Truex, Jr., won a NASCAR Sprint Cup Series race, George W. Bush was in his final term as President of the United States. “Rags to Riches” became the first filly to win the Belmont Stakes in 102 years, Dr. Jack Kevorkian was released from prison after serving an eight-year sentence and Ali Hassan al-Majid -- known as "Chemical Ali" -- was sentenced to death for killing 180,000 Kurds at the direction Iraqi strongman Saddam Hussein. .
Sunday, 218 races after his last win at Dover International Speedway, Truex led three times for a total of 51 laps and drove away from challenger Matt Kenseth on the final restart en route to a dominant victory in the Toyota/Savemart 250 at Sonoma Raceway. It’s not like Truex has been out to lunch these last six years. He has finished second a half-dozen times in that span, coming agonizingly close to Victory Lane. Time and again, he and his NAPA Toyota team came up short, adding another maddening digit to that winless skein. Sunday, however, there were no mistakes, no miscalculations, no mechanical failures and no late-race twists of fate. Nothing but a red-hot race car and a driver determined not to be denied again. In the decisive final laps, Truex drove away from one of the finest road racers on the planet in Juan Pablo Montoya, opening a comfortable, multi-second lead that was not about to be challenged. When Montoya sputtered out of fuel on the final lap, Truex’s victory was guaranteed. 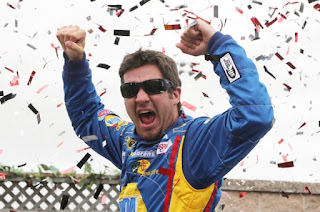 And after becoming the seventh consecutive first-time Sonoma race winner and ninth different victor there in as many races, the normally soft-spoken Truex was overcome with emotion. “I tried to cue the radio once and I couldn’t even talk,” said Truex afterward. “I was a mess, it was terrible. I had to stop doing doughnuts because I couldn’t think about what I was doing. Sunday’s win boosted Truex back into the Top-10 in championship points, the latest surge in his rollercoaster pursuit of a spot in the 2013 Chase for the NASCAR Sprint Cup. A 24th-place showing in the season opener at Daytona combined with a 36th the following week in Phoenix to put the NAPA Toyota team into a deep early hole. They didn’t crack the Top-10 in the championship standings until Charlotte in May, and recent rough outings at Dover and Pocono wiped out that progress, dropping them once again to 17th in the standings. Now, Truex hopes he has turned the tide for good, allowing him and his Michael Waltrip Racing team to string together enough top finishes to make the Chase and contend for the title. “We have had some very, very tough breaks,” insisted Truex Sunday. “We could have won three or four races in the past year and a half, if things had played out differently. Days when you do everything right and still don’t win, it’s really frustrating. But that’s the way it goes. “Today, it played out in our favor, and I was glad it finally happened. “Today was our day (and) we're going to get a bunch of them now. I can tell you that." COMMENTARY: How Do We Move On? Montoya To Johnson, "I Was The Leader, Not You"